Anyone who owns a garbage disposer knows that it can get smelly, to say the least. It’s only natural, considering the food waste that the machine processes. Still,if your garbage disposal smells like mold, fish, sewage, or other disgusting stuff, here are some tips on how to deodorize most garbage disposals. Thankfully, removing food waste odors from the disposer is an easy, 5-step process. Simply follow our instructions on how to deodorize most garbage disposal units to obtain the pleasant scent you’re looking for. Prior to working on any part of your disposer, ensure safety. First, unplug the unit and turn off the circuit breaker. Once you have completely disabled the power source, grab a flashlight and a pair of tongs. Use the flashlight to inspect the interior of the garbage disposal. If you see any small bits of food waste that may have been caught inside for a while, use the tongs to remove them. NOTE: Never remove obstructions from garbage disposals with your hands (neither bare nor gloved)! If your unit is clogged or jammed in other ways, you can look into our quick fixes for the most common garbage disposal issues. Using baking soda and vinegar to clean a garbage disposal is probably one of the smartest tricks in the book. While vinegar is a fantastic natural disinfectant, baking soda absorbs and removes the nasty odors with ease. Measure two cups of baking soda and tip them into the disposer drain. Afterwards, take one cup of vinegar and gently pour it into the same drain. Allow the natural solution to fizzle up your drain and soak for roughly an hour. After an hour, run a cold stream of water for 1-2 minutes. During this time, turn on the disposer and keep it running so the impellers do their job. When you’re done, turn the disposer off, unplug it, and switch its circuit breaker to the “off” position for the next step. The baking-soda-and-vinegar remedy for a smelly garbage disposal doesn’t stop here. You can use the same ingredients to obtain a natural cleaner that you can use to scrub any reachable components. Mix some baking soda with a bit of vinegar into a disinfecting and deodorizing paste. Grab an old toothbrush and dip it into the solution. Scrub all the rubber and metal pieces you can reach without diving too deep into the disposer. The splashguard, in particular, is prone to harboring bacteria and nasty smells. Now, it’s time to give your disposal a thorough rinse. Place a stopper in the drain and turn the faucet on and leave it running. Pour around 2-3 teaspoons of dish detergent in the water while it’s running so it becomes soapy. When the water level reaches about 5-6 inches, turn the faucet off. Unplug the drain and turn on the disposer so it can run while the water drains. While some people prefer using the peels, others opt for wedges. If you don’t want to waste the entire fruit, you can simply grind up the citrus peels. Alternatively, cut a citrus into wedges and process them in your disposal. Either way, the resulting scent will be lovely. To sum up, learning how to deodorize a garbage disposal unit is a piece of cake. You won’t need any complicated tools or cleaning solutions; only a bit of patience. To keep your disposer in tip-top condition, we also recommend that you check out our full guide to how to clean a garbage disposal and our garbage disposal maintenance tips, which are sure to help you out. 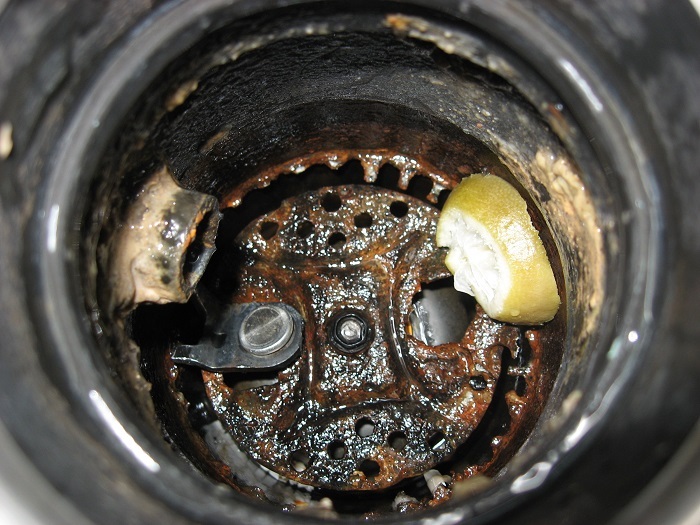 Do you have any other advice on how to deodorize garbage disposals naturally? Perhaps some alternative ingredients? Feel free to share your thoughts in the comment section below.